Then we drove south for about twenty kilometres along the side of the canal in sugar cane country. I looked at this canal until it became ordinary to me. It was a canal, that was all. Idly, I asked Alaa which canal it was and he said it was the Bahr Yusuf. I was moodily and quite illogically vexed. For Joseph’s Canal is alleged by all persons like myself who prefer a good story to literal historical accuracy (whatever that may happen to be) is, I say, alleged to be the very canal that Joseph he of the coat of many colours built for Pharaoh. They say that lot say that it isn’t Joseph’s canal but a canal built by a much later Joseph. Did you ever hear anything so silly? Before I had seen it I had already made my mind that even if it wasn’t biblical Joseph’s actual ditch, his must have lain along the same line so what’s the odds? You put a canal in the best place for it so the later one was no more than a restoration of the original. I had promised myself such a thrill at seeing it; but now I had been looking at it for twenty kilometres and made it so ordinary to myself that my promised frisson was entirely lacking. But still, it was Joseph’s Canal. It was, I think, a greater, a more impressive, a wider leap of the imagination than the pyramids. There was and is a great depression in the desert on the western side of the Nile opposite Cairo. This is the Fayoum, between twenty and thirty miles square. Right back in the earliest pharaonic days someone conceived the idea of deflecting surplus flood water from the river into that depression and then here is the leap of letting it out again into the Nile when the flood was inconveniently low. But this join between the main stream and the Fayoum could not be made down by Cairo. The main stream for obvious hydrostatic reasons had to be tapped hundreds of miles to the south so that the gradient of the canal would be so gradual the water would be controllable. So there the canal is, huge in length, vast in scope and breathtaking in the sheer imaginative size of the conception. Now here it was, a canal like any other and I found I had to screw my wits up to remember what it was I was looking at. 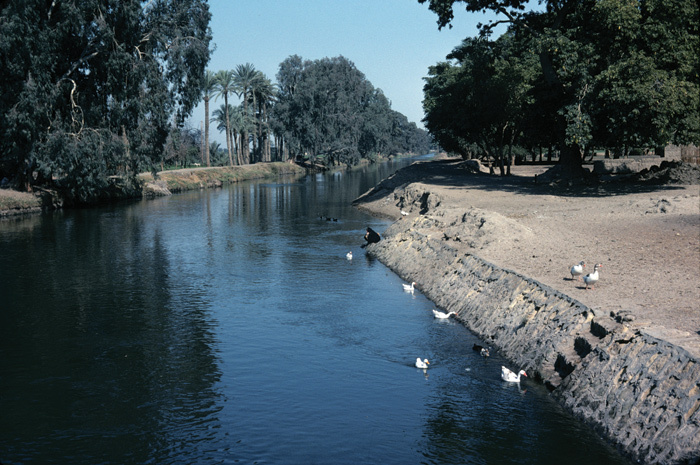 This was Joseph’s artificial river (to match his granaries) which turned the Fayoum into the first man-made lake. From the summit of the Pyramid of Amenemhat III, a fine view is obtained of the fertile province of Fayoum, stretching to the northward and westward, far into the Western Desert.